bilig started publication in 1996 as a scientific-cultural journal published by Ahmet Yesevi University. It is published in Turkish as spoken in Turkey and in English. Turkish, English and Russian abstracts accompany each article. bilig is published quarterly in Winter/January, Spring/April, Summer/July and Fall/October. The first six issues of bilig were edited by Himmet Kayhan, lawyer, and the late Prof. Dr. Şerif Aktaş. From the seventh issue onwards it became an academic journal under the editorship of Dr. Mümin Köksoy. Later Prof. Dr. Mustafa İsen served as editor-in-chief for bilig until the 25th issue followed by Prof. Dr. Osman Horata (Issues 25-39), Prof. Mehmet Öz (Issue 40) and Prof. Dr. Nurettin Demir (Issues 41-74). From Issue 75 onwards, Prof. Dr. Fırat Purtaş has taken over as editor-in-chief. The members of the Editorial Board are selected based on the frequency of submissions from each research area and the primary research interests of the journal. Although institutionalization and continuity are among the major problems in the publication of social science journals in Turkey, bilighas always upheld its on-time publication policy despite changing editors and members of the editorial board. In bilig such changes have always taken place in a healthy atmosphere, and leaving editors and members have shared their experiences with the newcomers. As a result, continuity and quality have not emerged as problems for bilig. It is a major success for a social science journal to become a refereed, serious and well-respected publication of international quality. However, these do not suffice to have a journal of truly international character. Essential for this purpose are submissions from abroad, readers’ interest, accessibility by related scientists and being listed in respectable indexes both in Turkey and abroad. bilighas no problems concerning these essential requirements. Submissions are made both from Turkey and abroad, and the journal is accessible both online and as hard copy. bilig is one of the most trusted and respected academic journals among the social science journals which have their source in Turkey. 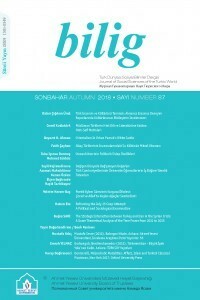 The aim of bilig, which publishes social science articles produced in the Turkic world as well as articles focusing on the Turkic world itself, has been specified in the editorial principles in the following way: “bilig aims to present the cultural riches as well as the historical and contemporary realities of the Turkic world within a scientific framework. It also aims “to present to the public scientific studies of international quality focusing on the Turkic World.” Furthermore, the editorial principles state that “bilig publishes articles that approach the current and historical problems of the Turkic world from a scientific perspective, proposing solutions to these issues.” It is also stated that submissions to the journal should be original articles evaluating previous studies in the field and should produce new and worthwhile ideas. Yet another statement relates to how bilig is also interested in publishing essays introducing authors and works and announcing new and recent activities related to the Turkic world. Here it should be remembered that the phrase “Turkic world” means both social science articles related to the Turkic world and social science articles produced in the Turkic world. Actually, it is somewhat difficult to draw a sharp line between the two meanings, as the published articles in bilig also demonstrate. However, in recent years the major increase in the number of submissions to bilig has led the editorial board to put more emphasis on social science articles focusing on the Turkic world itself. bilig has become what it is today through the significant contributions of the university administration, which has always believed in the necessity of this journal, of the authors who have submitted essays and articles and of faithful readers, of reviewers who have shared their experiences to ensure better quality, and of persons who have taken on responsibilities in the journal’s administrative and academic affairs. As long as these contributions continue, bilig will also continue to be a well-respected journal of good quality. Horata, Osman (2018). Has Bahçede Döne Döne, Araştırma-İnceleme Yazıları. Ankara: Akçağ Yayınları. Prof. Dr. Mehmet Fatih Köksal Kütüphanesi Türkçe Yazmalar Kataloğu (2018). Haz. M. Fatih Köksal, Mücahit Kaçar ve Mevlüt İlhan. İstanbul: Kesit Yay. Tatcı, Mustafa (Haz.) (2018). Hazret-i Pîr Şabân-ı Velî Kitabı. İstanbul: H Yayınları.